This is not happening all the time, but enough times for me to disable the screen saver. I use the Windows supplied screen saver, in this case, ribbons. It comes on when it is supposed to, but when I go to use the computer and do a mouse movement to exit the screen saver, the screen saver freezes and the only way to use my computer is to reboot the computer by forcing a shutdown with the on/off button. Thanks for any suggestions. try a system restore to a time prior to the issue. Let's try to consolidate discussion on this problem, as there are now THREE threads that I am aware of (on SevenForums alone, not counting elsewhere on the Interweb in other forums). I'd like to propose any continuation of discussion on this topic to the new thread which was created today, complaining of "Windows random freezes". Same with a similar thread complaining of "Random PC freezing - no pattern", which is also currently active and which I have also suggested be consolidated going forward on the same "Windows random freezes" thread. Rather than post similar or duplicate remarks to three threads, let's just use that one "Windows random freezes" thread solely, from now on. Respectfully, this "freezing" is a major problem It was first reported last year and was originally and already theorized to possibly be caused by a whole mess of assorted possible causes, including hardware failure, corruption in Windows (which might be "cured" through SFC), screensaver on or off, USB external removable devices, wired/wireless mouse and keyboard, etc., none of which has been definitively been found to have been the cause. Consequently there is no current solution that applies to everyone's own version of the "freeze", because the cause of the problem is still unknown. Absolutely everybody's hardware and software setup and customization are almost certainly different than everybody else's, and yet we all are experiencing the very same "freeze". Why not share everybody's story in one place, which may rattle some cages and light up some bulbs that give someone a new idea they never had before, perhaps eventually letting all of us discover what it is that we really do have in common (aside from Win7) which might never otherwise surface in multiple individual threads with individual suggestions from others? I honestly don't care if this thread is to be uniquely continued or not with additional contributions from others. I only wanted to really point out that there are now at least THREE pretty identical threads describing the identical problem: "freeze" of mouse/keyboard/screen, while Windows may continue for the most part to run (though hobbled) for some additional time before it finally does become totally unusable and require a hard power-off/on sequence to re-boot. No BSOD, just an external "freeze" of the human interface devices. And yet Windows continues to run inside the machine, including updating the displayed clock time normally. So the system isn't completely frozen. Thanks for the replies. I do not know if windows is running, not running, showing an error message, or what. My display is all black except for wherever the screen saver stopped running when I move the mouse to come out of screen saver. I have no other issues with my pc other than this random intermittent lock up. I have disabled screensaver and have no more freezes. If I enable screensaver, it may take two weeks to happen again. Just out of curiosity, do you have your desktop machine as the only machine on your home network? Or do you have other machines on your LAN? What other programs, if any, that you auto-start with Windows as part of "startup" and thus which are active all the time even if no manually other program windows are also open? Do you run any hardware monitoring programs (like Aida64), and if so do they report HDD/SSD drive temperatures? What brand of mouse do you have, and is it wired or wireless? What other USB and/or removable devices and/or external drives do you also have plugged into your desktop machine? What internal drives do you have? SATA HDD spinner, SATA SSD, M.2 NVMe SSD? After you are forced to re-boot following a freeze event, have you looked in EVENT viewer (Administrative events initially) to at least look back to see the most recent critical/error/warning things that got reported before the re-boot? Doesn't mean whatever caused your freeze will correspond to something recorded in Event Viewer log, but it's possible something there might be unusual and stand out. Certainly if you do this each time you re-boot after a freeze, you might notice some kind of repeated pattern of events which seem to always be present when a freeze occurs, and this possibly could provide more clues. Note that if you haven't cleared out the event log you can right now look back at your events records well far into the past, which would certainly cover a number of the recent freezes. 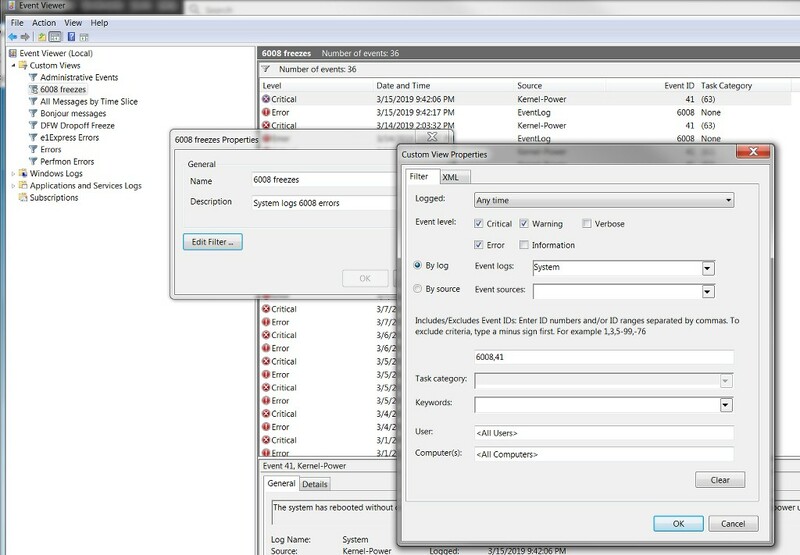 For example, you can create a "custom view" (see my screenshot below, from my own freeze situation) looking for critical and error event ids 6008 and 41, which will identify the date/time each of forced manual re-boot following a freeze occurrence. Then you can go back and look at the complete Administrative log just before each of those date/time freeze-reboots, to see what got recorded just before the 6008,41 event sequence. 1- I have this desktop and one laptop always running on my lan. Occasionally another laptop, which serves as my audio source for my stereo. The desktop is hardwired, the laptops are on the wireless. 2- For startup programs, norton, aol desktop, sun java update sdtray, garmin express, nvidia nvbackend & shadowplay. These are what show up using WinPatrol. 5-one external usb hard drive that I use for daily for backing up the my documents folder using Karen's Replicator. 7- When I go into event viewer I get a message: "event log service is unavailable. verify the service is running." I attached two Word documents showing this. 1 - And both the desktop and always-on laptop are both Win7? That's the same as my own situation, but I have two always-on Win7 desktops. And then I have one or two additional Win10 laptops that may occasionally be on. 6 - what is your "power settings" profile (from Personalize -> screen saver -> change power settings)? Are you using "high performance" or "balanced" or some other customized or modified profile values? In particular I'm curious about (a) hard disk, (b) sleep, and (c) processor power management. 7 - for some reason your "Windows Event Log" service isn't running. What version of Win7 are you running? I wonder if Basic or Home doesn't include Windows Event Log service, although it definitely is present in Pro and Enterprise. Click Start or tap the Windows key and type services in the "search" area but do not hit Enter. Locate Services (identified by the two small gears in its associated icon) which I believe it will be the second item down in the search hit list. You can also select the first item in the search hit list ("component services") but then you'll need to select "Services (local)" on the left when the window opens, in order to see the running Windows services. Once the Services pane has opened and populated, enlarge the window and spread the columns so that you can see each text area easily. Scroll down the alphabetical list of services and locate "Windows Event Log". Note its current Status (third column) and Startup Type (fourth column). It probably is not running, based on your error message. Double-click it to get the Properties dialog and on the General tab, change the Startup Type: to Automatic (halfway down) and then click the Start button a little further down. That should get the Event Log service started. You can close the Services pane. This does not gather messages that occurred when the service was not running but it should start a historical log of new events and the Startup Type: Automatic should ensure that it remains running when you restart the computer. I now see from your system specs that you are using Win7 Pro. So you should have Windows Event Log service present, or at least available. Even if it's for some reason not been started automatically you dhouls be able to start it and specify "automatic", in your Win7 Pro system. One more question about your setup... does your desktop machine have one or two monitors connected? Looks like from your specs you only have one. I have two.